Christmas trees cannot be recycled if they are decorated with tinsel. Stray tinsel can be dangerous if ingested by animals. Try decorating for the holidays with paper chains. Paper chains are inexpensive, and can be composted or recycled if they are stapled together. Don’t recycle them if they are glued together. 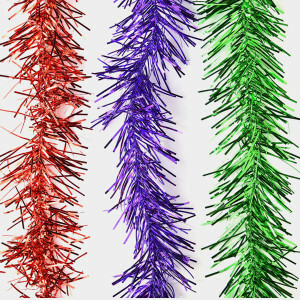 Pack up and reuse the tinsel to decorate your home next year. You can also use it to make bows, wreaths and other home-crafted holiday decorations. Tinsel isn’t easy to remove completely from a Christmas tree. When trees are put out for recycling, wind and rain can sweep tinsel into storm drains. From there, it can be ingested by wildlife and cause harm.